Ann is a 1983 graduate of Michigan State University. She has worked in general, emergency, and specialty practice, as well as education and management. Ann is active in her state, national, and specialty organizations and served on the organizing committees for the internal medicine and nutrition veterinary technician specialties. She has mentored over 15 fellow veterinary technician specialists. She has published over 45 articles in professional magazines, as well as book chapters, and is a coauthor of Nutrition and Disease Management for Veterinary Technicians and Nurses, now in its second edition. Everywhere we look these days we find products that include probiotics, prebiotics, or both. These can be in the form of supplements, known as nutraceuticals, or over-the-counter foods and therapeutic diets. According to the hype, these products can improve the immune system and gastrointestinal (GI) function while performing a number of other tasks just short of emptying the litter box. FIGURE 1. What’s in a name? An at-a-glance guide to the difference between prebiotics, probiotics, and synbiotics.Photo shutterstock.com/Alexander_P. Because nutraceuticals are not pharmaceuticals, regulatory scrutiny over the sale of these items is minimal. Thus, it can be challenging to find products that not only do what their manufacturers say they do but also contain viable bacteria in the types and amounts specified on the label.7 Not all commercially available products provide the same level of usefulness, so it is important to understand what products, especially probiotics, have actually been evaluated in dogs and cats. Not all bacteria provide the same benefits with all species, nor are all products tested and evaluated to the same extent. No studies have shown that supplementing pet diets with yogurt or other fermented food products, such as kimchee, benefits the pets themselves. Oligofructose is a 2-8–chain fructose-based saccharide molecule that undergoes fermentation fairly quickly in the colon, providing nourishment to the bacteria in that area. Examples of FOS sources include soybeans, oats, beets, and tomatoes. Inulin is a longer 9-64–chain fructose-based saccharide that tends to be fermented more slowly, benefiting bacteria farther down the colon. It can also be broken down into FOS by intestinal bacteria to provide both FOS and inulin. Inulin can be found in Jerusalem artichokes, jicama, and chicory root. Synbiotics are a balanced combination of probiotics and prebiotics and may be advantageous for treatment of various GI diseases. The prebiotic portion may improve the conditions in the GI tract, enabling the probiotics to maximize survival, and may increase proliferation and adherence of the beneficial bacteria.4 Prebiotics may enhance or potentiate the benefits of the probiotics found in these products. A study by Weese and Martin, at the University of Guelph in Ontario, Canada, compared the actual product contents vs label statements for a variety of commercially available probiotics.7 Of the 25 products evaluated, only 2 had acceptable correspondence between actual production of bacteria classes and what was stated on the label. All products were evaluated before their expiration dates.7 Prostora™ (produced at the time by the Iams Company) and FortiFlora™ were the top performers. Prostora™ was discontinued after Royal Canin acquired Iams. FortiFlora™ is still available. Because prebiotics are used as both a source of nutrition for the colonocytes and a fiber source for the animal, inclusion in the diet is fairly easy. The ingredient panel should list the fiber source but may not state whether it is a source of FOS or inulin. Increasing your familiarity with the different fiber sources used, and their relative FOS and inulin contents, can help in evaluating a diet. When in doubt, contact the manufacturer for further information. When evaluating prebiotic or probiotic products, ensure that research supports the claims given, that the products contain the stated levels of additives, and that the products promote normal intestinal microflora. 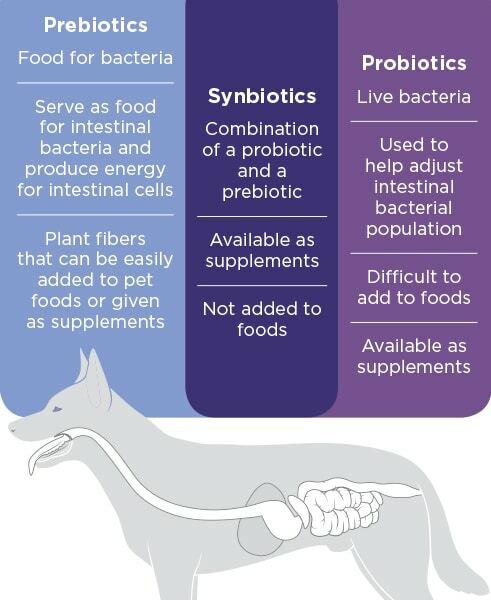 A review of probiotics in commercial dog and cat foods by Weese and Arroyo demonstrated that few products meet these guidelines.1 Alternately, evaluation in a controlled clinical setting can provide firsthand knowledge of the effectiveness of the products used. By applying this strategy, you can ensure that you are providing the best product to support a happy, healthy intestinal tract with a hard-working population of beneficial bacteria. Weese JS, Arroyo L. Bacteriological evaluation of dog and cat diets that claim to contain probiotics. Can Vet J. 2003;44(3):212-216. Pan XD, Chen FQ, Wu TX, Tang HG, Zhao ZY. Prebiotic oligosaccharides change the concentrations of short-chain fatty acids and the microbial population of mouse bowel. J Zhejiang Univ Sci B 2009;10(4):258-263. Marks S. Probiotics—not just for people anymore. Proceedings of the 2017 Western Veterinary Conference, Las Vegas, Nevada. Steiner JM. Understanding the benefits of prebiotics. dvm 360. July 1, 2009. veterinarycalendar.dvm360.com/veterinary-team-understanding-benefits-prebiotics-sponsored-iams. Accessed November 6, 2018. Lerman A, Lockwood B. Nutraceuticals in veterinary medicine. Pharm J 2007;278:51. Kelly M. The role of probiotics in GI tract health. Nestle Purina PetCare Company. purinaproplanvets.com/media/1181/role_of_probiotics.pdf 2006. Weese JS, Martin H. Assessment of commercial probiotic bacterial contents and label accuracy. Can Vet J. 2011;52(1):43-46. Roberfroid M. Prebiotics: the concept revisited. J Nutrit 2007;137(3 Suppl 2):830S. Verdonk JM, Shim SB, van Leeuwen P, Verstegan MW. Application of inulin-type fructans in animal feed and pet food. Br J Nutrit 2005;93(Suppl 1):s125-s138. Heinz CR. Good bugs/bad bugs: the confusing world of probiotic supplements. Pet Foodology. vetnutrition.tufts.edu/2017/06/probiotics. Accessed November 6, 2018.